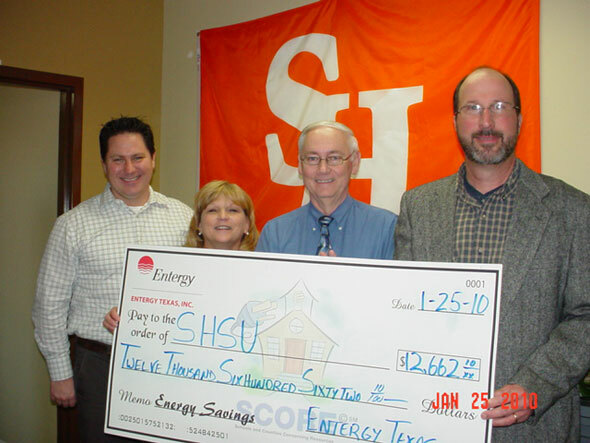 From left: Phil Lanier, SCORE Program; Sandra Gray, SHSU energy manager; Doug Greening, SHSU associate vice president for physical plant; and Tim Runnels, Entergy. Sam Houston State University has been awarded an incentive check of $12,662 by the Entergy Texas Schools Conserving Resources (SCORE) Program for incorporating energy efficiency lighting and air conditioning systems into several campus buildings including the Physical Plant Office, Southeast Texas Applied Forensic Science Facility, and Recreational Sports Building, among others. In addition to financial incentives, the SCORE Program provided no-cost technical assistance to facilitate the implementation of the energy efficiency upgrade projects. The improvements took place over several months during 2009. The incentive amount was determined by the total amount of energy the university will save. The new lighting and air conditioning systems will save more than 229,250 kilowatt-hours of electricity per year, equivalent to the carbon dioxide emissions of about 18,500 gallons of gasoline, according to Environmental Protection Agency calculations. The SCORE Program worked with the university to involve personnel from all departments in the decision-making process so that everyone understood the financial benefits of investing in the projects. “It’s important that everyone understands that while high-efficiency equipment can cost more initially, it easily pays for itself through the energy savings and incentives available,” said Gray. The university plans to use the money for more energy conservation projects and to develop additional incentives, according to Gray.